Maplewood planning and zoning Monday night approved a new wine bar/restaurant, with retail wine by the bottle at the former J&E Office City location — 7326 Manchester Road. Owner, Brian Hobbs, was the general manager at Bar Les Freres in Clayton for four and a half years, a job he left two and half weeks ago, he told the commission. Hobbs plans on calling the new wine bar Chateau Maplewood, he said after the meeting. It will have about about 20 tables and a wine bar for eight. He plans on serving lunch, dinner and desserts, but the focus will be on wine — a “full wine experience,” he said. He said Maplewood contractor, Patrick Jugo is doing the buildout. City council will consider the request at its August 22 meeting. 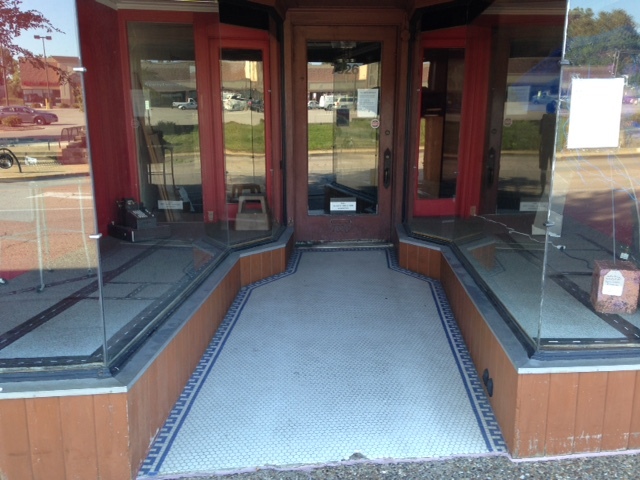 The entrance to the former J&E Office City, to be the future Chateau Maplewood. The owner’s association with Ernesto’s and Bar Les Freres have me hopeful that Chateau will be a similarly appealing place to wine and dine. What a great addition to Maplewood. I’m very hopeful that this will pass quickly–a wine bar would be a great addition to downtown Maplewood! Most of the places to get a glass of wine have pretty small bars, so it’d be nice to have a dedicated spot. And maybe they could stay open past 10pm?